The Occupy movement—no matter how many protestors—is overpowered by the might of the power-elite’s police force and “weapons of gas-destruction” against the poor and disenfranchised, students, and the once middle class, as the early colonists were by the British empire. Long before the first shot was fired at Lexington—the shot heard ‘round the world that it seems history does not claim was fired by either side, however eight colonists were killed and ten wounded while only one British soldier was wounded—or the Boston Tea Party occurred, Americans were meeting in all thirteen colonies to discuss what to do about the oppression by the British Empire over the Americans. And they met in churches, and many of those pastors became the first organizers of civil disobedience. The Americans began to show dissent on the streets in all thirteen colonies, and the unrest soon got back to the crown in England—the power-elite of that day. Let us hope that the first shot is not fired in the Occupy Wall Street movement, because the people do not want civil war with arms in America. They just want justice to the people. Unfortunately, the first shot was fired in the Revolutionary War, and reprisals and the armed war were unstoppable, because the British Empire was unwilling to change and give justice to the people. And so the Revolutionary Army had to be formed and organized and use different tactics to survive. And they had to find a leader to lead them. George Washington was chosen by the existing delegates of all the states of the colonies because of his military experience and the fact that he was a man who recognized the importance of the Creator’s guidance in his life and in military tactics. As all good generals understood throughout history—from Akhenaten of Egypt to David of Israel to Alexander the Great to Constantine to Oliver Cromwell of England to the Founding Fathers of America—they had to take guidance from the Creator or a higher power other than themselves. Washington, listening to the Creator, decided on hit-and-run tactics. He understood that the British were too strong to fight like they fight, two opposing forces charging against each other in open fields. The British had better training, better weapons, and longer bayonets. So Washington prayed to the Creator and came up with the same Spiritualution principles to win the war that I am about to share with those who read this article. Washington got together with his men and prayed with them before all battles. 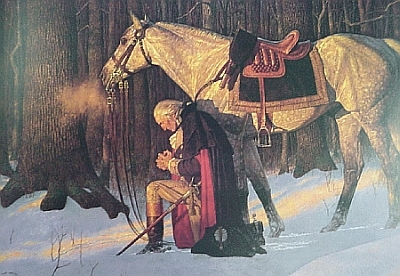 The men prayed daily at Valley Forge with Washington, to get them through the harsh winter. Men of all walks of life—farmers, business men, tradesmen, blacksmiths, bakers—with the pastors (who many of them also were in arms) prayed for guidance. Washington told his men to hide behind trees and huge rocks and to disappear like ghosts. Now the Occupy movement is trying to make a statement, and the movement has to remain passive, without weapons of course. But they still have to do several things with the hit-and-run maneuvers. 1. Washington and his strategic organizers, the night before any confrontation, met and prayed and planned where the colonists would present themselves the next day in various locations, instead of one central location. This would separate the British Army and weaken their strength. 2. The next day, the organizers met with the Revolutionary Army in one central location in the morning and prayed together and then gave the orders where to occupy. They had alternate places for each confrontation location in case they had to retreat. 3. When the British soldiers came to those locations, the colonists, if overpowered, left if too many colonists were wounded or killed. They could never beat back the British by yelling and trying to scare the British off, for the British were there to beat them with the sticks, pepper spray, and gas of the day, which was the British long rifles and cannons. The colonists went to the next location separately and not in a line, as to not give attention to where they were going. Some even went the opposite direction together to be seen, therefore throwing off the British by decoy. 4. The King and Queen of England and the power-elite there felt that they were safe in their castles and mansions and their hundreds of thousands of acres, but the poor people of England (and France), by the thousands, who identified with the colonists of America, demonstrated outside the gates of the castles and mansions, without going onto the privately-owned land—just close enough to make a noise and to make the occupiers’ presence known. They did not block the elites’ entrance in or out, as this was civil disobedience and peaceful at all times. They did not give the elite an excuse to use violence. The poor people understood that the British soldiers might shoot anyway, and the poor had runners and couriers there to report to newspapers any violence to them by the British soldiers. Unfortunately, in their day they did not have cell phones handy with cameras and videos, and even Ustream. But they did have a global consciousness of the sufferings of other peoples in other countries, just like the Occupy movement all over the world has today for their planetary brothers and sisters. If you do a study of the Founders of our country, you will come to the conclusion that all of them had some kind of relationship with the Creator. There were Christian scientists, Free Masons, and other Protestant denominations, and even Catholics (which most history books do not acknowledge). When they wrote letters to each other—which was the method of communication in those days—the colonial delegates always invoked the Creator in some way. They may have had different opinions in the political realm, but they were of the same divine mind on things of importance when it came to the betterment of humanity as a whole. Thus the United States Constitution was written for the common good of all people, and those people included Moslems, Buddhists, Hindus, Native Americans, and people of all religions, even though the framers of the Constitution were mostly of the Christian persuasion. They did not have the vision yet of a united planetary government, but they knew that there needed to be religious freedom in the new country they were forming. Many of them had been through the abuse of authority in Europe by religions and the powers-that-be back then. The framers of the Constitution did not leave out the Creator as a fundamental denominator in their decision making, when it came to serving the people. That is why our country became great. And people came here from the four corners of the earth for religious freedom to worship the Creator as they saw fit. The power-elite have gradually, from the beginning of our country, tried to control the masses by bringing in Godless tyranny behind the scenes, trying to control as many of the masses as they could. Today they are the 1%, and the people are the 99%. The 99% has to adopt the simple message of radical unity under one Creator, because we are of “One Creator, One Planetary Family.” If the masses do not reconnect with their Creator individually, they will not win this revolution in trying to change corrupt and evil systems. The 99% need the Creator’s assistance—this is what George Washington knew, the delegates of all the colonies knew, and the common people of the day knew—or the movement will fall to the wayside, just like the peace movement did in the 1960s. Many of them became YUPPIES and entered the Great American Dream again, because enough of them did not trust in the Creator for guidance. What the Occupy movement lacks today are true Godly leaders, who gather the people to pray for guidance. Without these kinds of leaders, the movement will fail just like the peace movement in the 1960s fell to greed and fear, because only faith can overcome fear and only charity can overcome greed. And both of these attributes can only be found in a relationship with the Creator. I am not saying that there are not good people in the Occupy movement. But many a good person has lost heart and purpose without a higher vision and the Deo (Godly) power of the Creator to sustain them through difficult times of suffering that comes in all forms—some manmade by the powers-that-be against the poor and disenfranchised and now the crying-out middle class, some by the effects of global warming that is causing worsening weather patterns and other changes all over the world mostly due to corporate greed and unsustainable practices that are causing severe damage to the earth’s atmosphere, water, and soil. These are the times spoken of by many prophets of old concerning what Jesus referred to as the separation of the good seed from the bad seed. And when it comes right down to it, there are those who are more good and there are those who are more bad, and people who are more good usually have a connect with a higher power than themselves. Although they may not call that higher power “God” or “Creator,” they have a connect to something other than themselves nonetheless, and they try to do what is right in their decision making for humanity, not just for themselves. This is the separation I am talking about and the separation that Jesus spoke to His apostles about concerning these days of the times of trouble on this earth. What we need to accomplish today is a world with no borders, where nationalism is not idealized and patriotism is not just towards a country or one flag, unless that flag represents all the peoples of the planet, because we need to all come to the place where we understand that there is “One Creator, One Planetary Family.” We have to get bigger than just making changes here in our own country. The poor, disenfranchised, suffering peoples of the whole world are crying out for justice. We have to think bigger than just being a citizen of the United States, for we are citizens of the world. George Washington and the framers of the Constitution believed this new country was the beginning of the New Order of the Ages. Now we have to take it to another level of consciousness and join our voices and hearts with the people of the world who cry out for true freedom and become a Divine New Order, under one Creator, coming out of antiquated evolutionary religions and dogmas and taking the exciting adventure of listening to the voice of the Creator—rather than the voice of the corporations, the corporate-owned media and false journalists, and the sold-out celebrity and sports stars—and find your destiny in the Creator’s guidance.